Galfer Brake Pads are available for most street bikes in a range of materials including semi-matallic, kevlar, and full metallic. If you are looking to upgrade your brakes without paying an upgraded price, Galfer black pads are the perfect choice for you. These GG rated pads out-perform most original equipment pads (which are usually G-rated only) by maintaining functionality at temperatures as high as 700 degrees. They offer extreme versatility with the ability to be used on both front and rear, and on both street and dirt with excellent effectiveness. These Semi-Metallic & Carbon pads offer great longevity while limiting rotor wear. These pads will give you a strong progressive feel allowing for a controlled braking modulation. Composition: Semi-metal, Carbon Installation: Clean rotor surface & bed-in with easy braking first 60-120 miles. Are you a middle of the road kind of rider? You can find middle ground between the black and green in the blue pads. These pads don't need to reach their peak temperature before they are at their best friction level. They are great for sport touring and can even be used on the track. The Kevlar in these pads give them a good bite, while the metal in the pads make them a durable choice. Composition: Semi-metal, Kevlar Installation: Clean rotor surface & bed-in with easy braking first 60-120 miles. If you need to stop on a dime, you better put on the 'Green'. The Kevlar-organic Green pads offer powerful, initial bite time after time with no fade. The versatility of these pads is unmatched. They can adjust to abrupt temperature and moisture changes and take little time to recover between braking. They can be used in all types of riding whether it is street, dirt, race, and any combination of each. These are better for an aggressive rider, since these offer one or two finger stopping power. For many riders, the ideal combination is using Galfer Green in the front with Galfer Black in the rear. If rotor wear is of great concern, the Galfer green would be an optimum choice. They won't last quite as long as the black, OEM or the HH pads, but their soft, organic material composition causes minimal damage to the rotor surface. Composition: Kevlar, Ceramics, Basalt Fibers Installation: Clean rotor surface (be extra diligent in cleaning if following an HH (Sintered) compound) & bed-in with easy braking first 60-120 miles. These are the hottest pads on the market. This sintered metal & ceramic composition allows for the ultimate friction, making their stopping power unmatched. It will provide instant powerful braking intensity in any weather condition or speed. The ceramic coating on these pads disperses the heat evenly, keeping the brake fluid temperature lower. This minimizes brake fade. These pads also have a longer life span than most other pads because of the high metallic content. These HH pads are rougher on rotor surfaces but work with optimum performance on Galfer Brake Rotors and other high-carbon content discs. Despite this assumption, these pads have remained popular with the aggressive off-road and street riders and are supplied to many race teams. Composition: Sintered Metal, Advanced Ceramics, Carbon Fibers Installation: Clean rotor surface & bed-in with easy braking first 60-120 miles. Notes on rating of pad friction: Pad Friction levels are designated by the alphabet system... the further down the alphabet the higher the friction level and double letters is stronger than single letter designations (for example: GG has stronger friction than G rating). 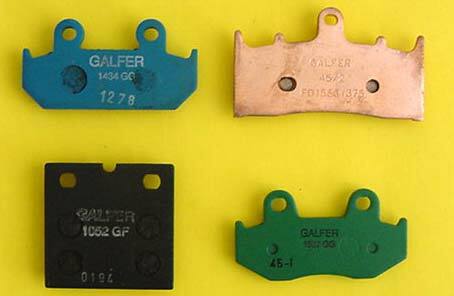 Other Galfer Brake Pad Compounds are available for specific applications: Super-Bike Race Use Only, Trials Motorcycles, and Harley-Davidson part number FD235, to name a few. These may be offered to you when you request your e-mail quote. 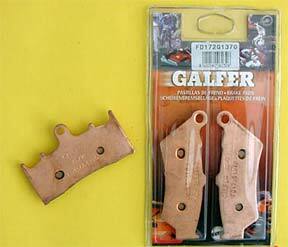 Galfer 1375 Compound Brake Pads. 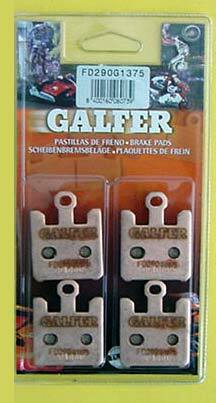 Galfer brake pads are available in sets of 2, (i.e. one caliper) and also sets of 4 (for 4 piston calipers) as shown here. Prices will vary. E-mail for quote and technical questions. We accept Visa, MasterCard, DiscoverCard, Pay Pal, Google and pre-payments (money orders/ cashier's checks only). Click here for Order Information. Click here for shipping & return policy. Click here for Sales Dept. From Ed in Raleigh, N.C.
You asked for feedback on the Galfer blacks you sent me last week. I installed them last Thurs. making sure I antisiezed all points where they come into contact with the caliper. So far (though I've only gone 20 miles) the squeal is nowhere to be found and I have no reason to think it will ever return. Thanks for helping me solve my problem. Cyclebrakes will get all my future M/C brake pad business!